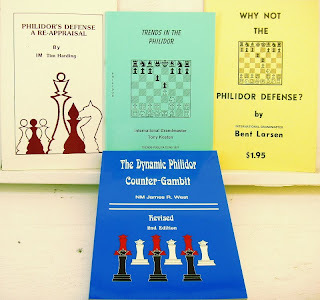 Join the debate on the Philidor Counter Gambit! The Avalanche-Journal of Lubbock is reporting that the USCF has filed a court request to obtain computer records from the Susan Polgar Institute for Chess Excellence to determine if Susan Polgar and Paul Truong leaked confidential e-mails from the Executive Board in June. Atomic Patzer shot this video at the New Jersey Futurity International 2008. 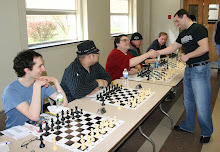 Steve Ferrero, who is editor of Atlantic Chess News, took these pictures at Saturday's Viking quads in Somerset. 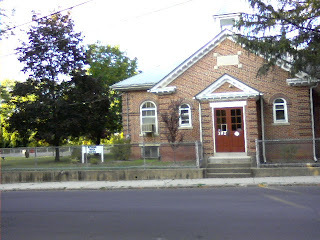 Among others, you will see James Luxich, Louis Sturniolo, Sal Geraci, Patrick Mazzillo, Anna Matlin, and me. 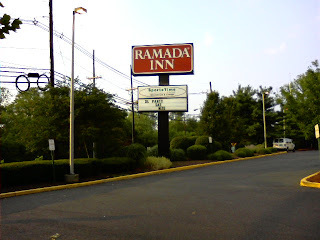 These pictures were taken by me during yesterday's Viking quads at the Ramada Somerset. 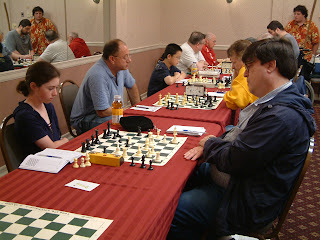 Two of the participants in quad one were Atlantic Chess News editor Steve Ferrero and Anna Matlin. 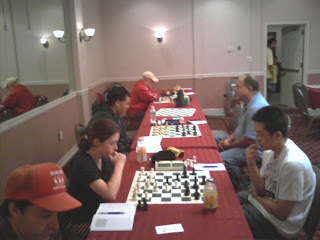 In round two, Anna Matlin lost in the endgame to NM Victor Shen. Here is second round play in quad two. 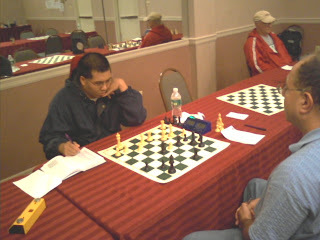 In the lobby, Patrick Mazzillo watches as Louis Sturniolo and James Luxich prepare to analyze Luxich's 15-move win against Sturniolo. At today's Viking quads in Somerset, my score was 2-0-1. These are the games, including one in the third round that ended in a time scramble with many mistakes. 36.Nc5 Rxb2 37.Nxd7 Qxd7 38.Qxh4 Ne2 39.Ra1 Rb8 40.Re1 Nc3 41.f4 Qa7 42.f5 exf5 43.Nxf5 Re8 44.Nd6 Rf8 45.Qg3 d4 46.e6 Qe7 47.Ne4 Nd5 48.Ng5 Nf6 49.Rd1 Rd8 50.Rd3 Rd5 51.h4 Rd8 52.Qf4 Nh5 53.Qf7+ Qxf7 54.exf7+ Kh8 55.Ne6 Rb8 56.f8=Q+ Rxf8 57.Nxf8 Kg8 58.Ne6 Kf7 59.Nxd4, Black resigns. 31.fxg5 Bxg5 32.Rxd3 Nf4+ 33.Kh2 Nxd3 34.Bc3 Re3 35.Bd2 Bf4+ 36.Kh1 Re2, White resigns. 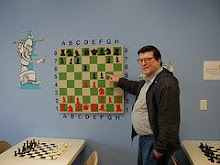 51.c5 Ke6 52.Rb6+ Kd5 53.c6 Kd6 54.c7+ Kxc7 55.Rxg6 Rxb3 56.Ra6 Kd7 57.Rxa5 Ke6 58.h4 Kf6 59.g3 Rb2+ 60.Kh3 Rb3 61.Kg2 Rb2+ 62.Kh3 Rb3 63.Ra6+ Ke5 64.Ra5+ Kf6 65.Rb5 Ra3 66.Rb4 Kg6 67.Rf4 Kf6 68.h5 Kg5 69.h6 Kxh6 70.Rxf5 Rxa4, draw. 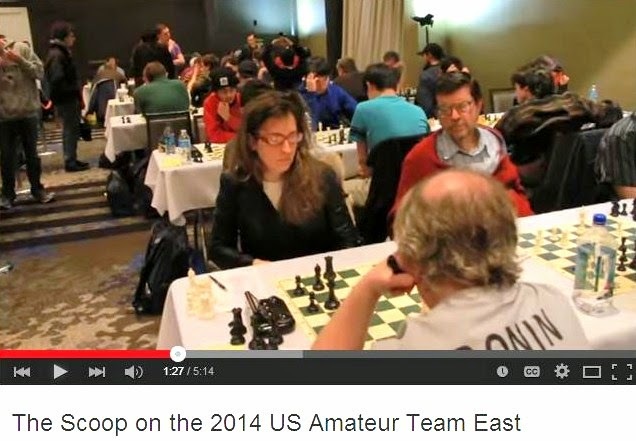 In this CNN interview, GM Maurice Ashley describes chess as "intellectual martial arts." 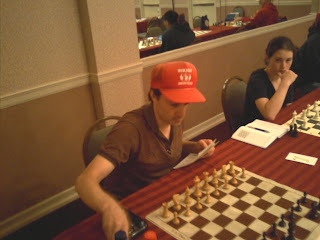 Maurice Ashley is the only grandmaster that I have ever defeated with the Philidor Counter Gambit, although I drew against GM Pavel Blatny with the PCG as well. 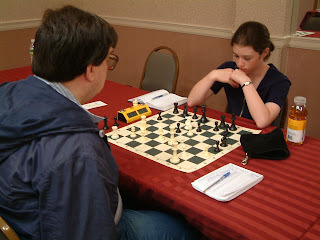 Ashley also won this game against me at the Marshall Chess Club, mistakenly reported as taking place in Chicago. 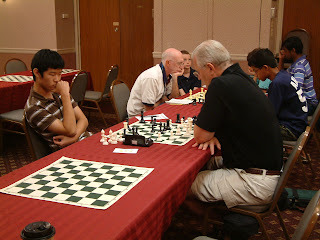 Here is a blitz game where a grandmaster loses to the Fajarowicz variation. Had he lived, actor Heath Ledger was planning to take two years off to direct movies, including an adaptation of The Queen's Gambit by Walter Tevis. 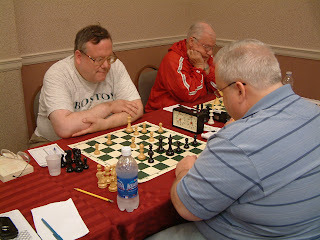 Although not mentioned in the tournament life announcements at the USCF website, the 1st Annual Greater Pitman Open Chess Championship will be held at the Pitman Manor on Saturday, August 16th. 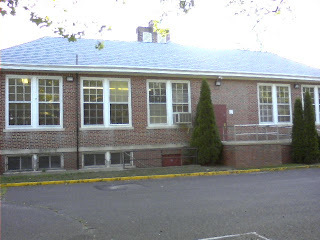 Tournament details are available here. 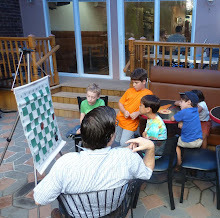 Chess blogger Atomic Patzer has revamped his blog to include a photo gallery, as well as a video Diaper with a bizarre ending from the Hamilton quads on June 14th of this year. You can find the same video and others at his YouTube channel. 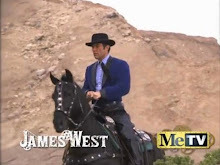 The one called Post Mortem was shot at last month's Viking quads on June 28th. 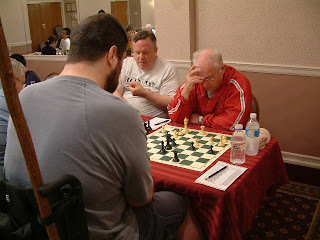 It shows Boris Privman and me analyzing my second round loss against Mauricio Camejo, with some assistance from Camejo and Andrew Ng, much to the consternation of Frank Romano in quad two. 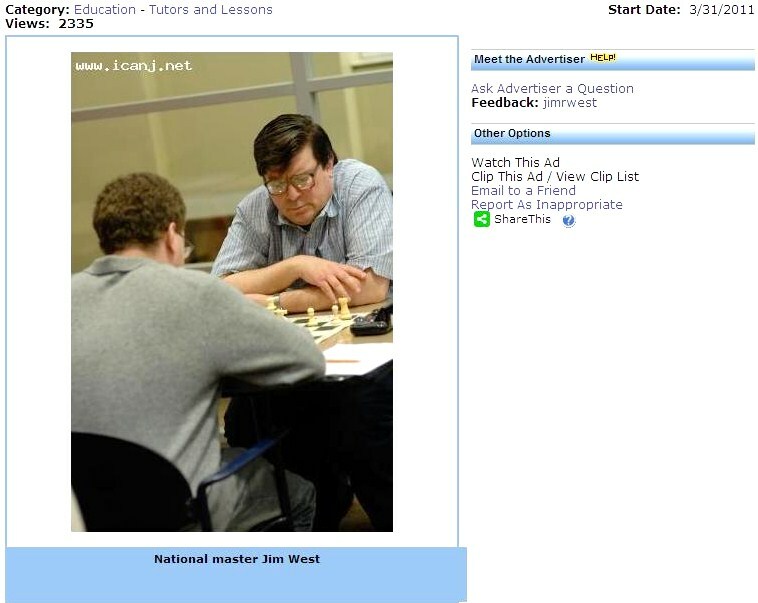 In the background of Mike vs. Diamondback, you can see me playing against Kavinayan Sivakumar on June 22nd at the Dean of Chess Academy, a month ago. 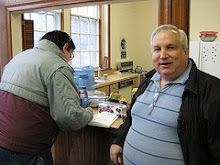 Yes, he is the same Diamondback whose e-mails have been featured at my blog in past entries! 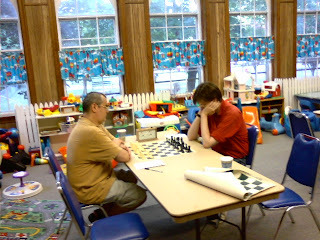 Having lost his first two games yesterday, my third round opponent at Hamilton forfeited against me, giving me the opportunity to take these photos. 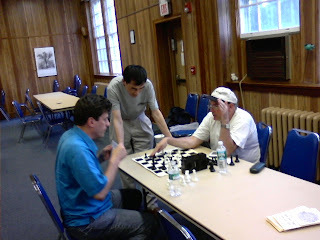 You will see shots of the Ray Dwier Recreation Center, the start of the contest between Dragan Milovanovich and Mark Kernighan, and analysis of a third round game from a lower quad. At today's quads in Hamilton, I played this hard-fought draw. 49.b4 Kd5 50.b5 Kc5 51.b6 Rd8 52.b7 Rb8 53.h3 Kc6 54.hxg4 hxg4 55.Rb4 Rxb7 56.Rxg4 Rb2 57.Rf4 Rg2+ 58.Kf1 Rxg3 59.Kf2 Rh3 60.Rxf3, draw. 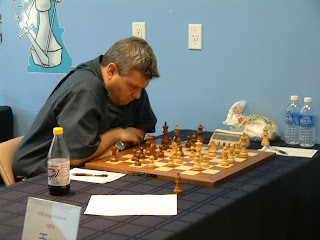 On Sunday, June 29th, GM Sergey Kudrin gave a 20-board simultaneous exhibition at the Greater Somerset County Chess Club in Belle Mead, finishing with a record of 19-1-0. 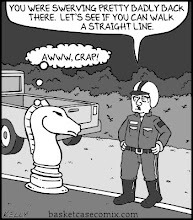 His lone defeat came at the hands of Alex Romayev who delivered checkmate to the grandmaster after an oversight by the GM. 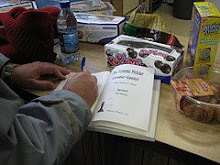 Alex won a book prize and will most certainly remember this game for a long time! Fun was had by all. GM Kudrin also took the time to answer questions from the audience. 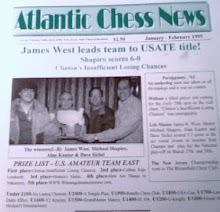 The July 2008 issue of Chess Life features a Philidor Counter Gambit in the Solitaire Chess column by Bruce Pandolfini. Black could have improved on 19...Ne8 by 19...d5 20.Nd6+ Bxd6 21.Bxd6 Rff7 (21...Re8 22.Be5 Rf7? 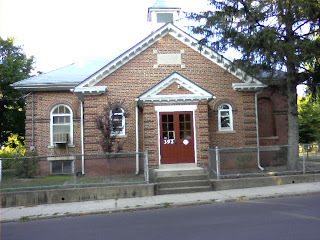 23.Ne4! Pandolfini) 22.Be5 g4 23.h4 Ne8 24.g3 Rxf1+ 25.Rxf1 Qe7 with only a slight advantage for White. If you have ever felt the urge to punch your opponent during a game of chess, you might be interested in chessboxing as seen in this video. 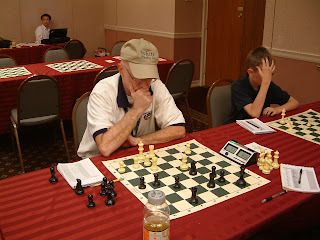 Atlantic Chess News editor Steve Ferrero took these photos at the New Jersey Futurity International 2008, held at the Dean of Chess Academy from July 7th through 11th. 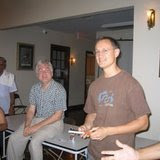 Here tournament organizer Michael Khodarkovsky presents the winner's prize to GM Sergey Erenburg. 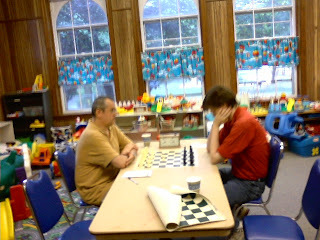 NM Mackenzie Molner ponders his position against IM Dean Ippolito who eventually won the game. NM Evan Ju lost to IM Milos Scekic who played brilliantly. 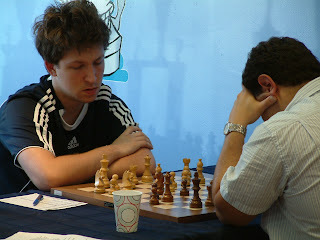 IM Alfonso Almeida Saenz lost this game to GM Sergey Erenburg who drew his fellow grandmasters while defeating everyone else. 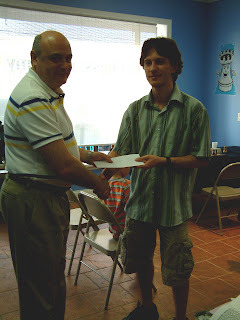 Not only did GM Sergey Erenburg win the New Jersey Futurity International 2008, he also was awarded the brilliancy prize for his victory against IM Dean Ippolito. 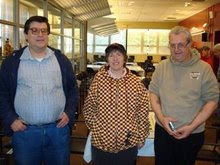 Playing in a Swiss tournament at the Marshall Chess Club today, I had a final score of 2-0-2, drawing the first two contests at game/30 and winning the next two at 30/90 followed by game/60. Here are the games. 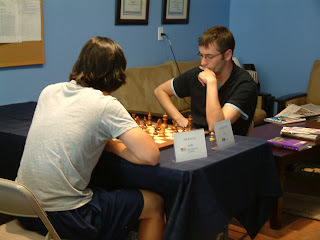 My third round opponent won the Under 1600 section at last week's World Open in Philadelphia. 30.Kg2 Ke8 31.Kg3 Kd7 32.Kg4 h6 33.h4 Rb6 34.Rf3 Kd6 35.Rc3 Ra8 36.Ra3 a5 37.h5 g5 38.Rf3 Raa6 39.Kg3 Ra7 40.Kg4 Raa6 41.Kg3, draw. 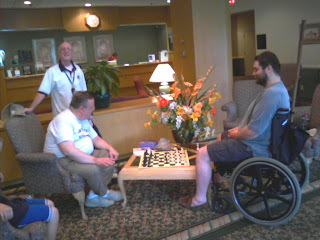 38.g4 a6 39.b6 a5 40.f3 Rdf7+ 41.Qxf7 Rxf7+ 42.Kxf7, stalemate. 33.c3 Ne6 34.b4 Rc8 35.Rg4 Rc4 36.a4 bxa4 37.Qa2 Rc6 38.Qxa4 Qc8 39.Qb3 Kh8 40.Ra1 Qb7 41.Qd1 Be7 42.h4 Bd8 43.Qd3 a5 44.bxa5 Nc5 45.Qb1 Qa6 46.Rg2 Qc4 47.Qf1 Qxf1+ 48.Rxf1 Bxa5 49.Ra2 Bd8 50.Ra8 Ne6 51.Rb1, Black resigns. 37.Ke4 Kd7 38.Kd4 Kc8 39.Kc3 Kb7 40.Kb3 Ka7 41.Ka4 Ka6 42.b3 Ka7 43.Kb5 Kb7 44.a3 Kb8 45.Kc6 Kc8 46.a4 Kd8 47.c5 bxc5 48.Kb5 Kd7 49.Kxa5 c6 50.dxc6+ Kxc6 51.b4 d5 52.b5+ Kb7 53.b6 c4 54.Kb5 c3 55.a5 c2 56.a6+ Kb8 57.Kc6 c1=Q+ 58.Kxd5 Qxg5+, White resigns.